With unexpectedly spicy food (not in a good way), lackadaisical service, and average ambiance, Ashoka the Great falls into the world of average. Sorry, Ashoka, you may want to rename yourself Ashoka the Fair. The Details: I wanted to love Ashoka the Great. I really did. I mean, in addition to the fact that it has "great" in the name, it's in a well-known foodie and cultural mecca that's been nicknamed "Little India". So, surely, it would be on par with some of the other excellent restaurants I've been to in Artesia...right? Sadly, no, the name is a misnomer, and the restaurant may want to invest in a branding expert to weigh in on whether "Ashoka the Fair" or "Ashoka the Average" has the better ring to it. Our trip started out above average. Most restaurants in Artesia, including Ashoka, have the option of only street parking -- but we found a close free spot around the corner and, in general, I don't mind a short walk anyway. Upon entry, the restaurant was pretty crowded (especially for a Sunday night, so I was impressed), and I liked the artistic touch of the running water fountain that's just inside the door. We were seated promptly in a semi-circle-shaped booth -- the kind of booth that I'm an absolute sucker for as it lets Nick and I sit next to each other without having to rearrange the place settings to accommodate the fact that, given the chance, we always try sit next to each other anyway. (A trait that once called a restaurant owner to refer to us "love birds" as he graciously rearranged tables to accommodate us.) In addition to the the semi-circle booths against the wall, there are also six-tops and other size standard tables and chairs in the rest of the restaurant -- which are good for larger groups. There is also a small well-lit bar area in the back corner, where it looks like customers can stop in for a drink or two. Nick was also thrilled because the two wall-mounted flatscreens were showing the football game. Now, I realize that some of you ladies out there may see this as a negative, but for me personally, I'd rather Nick be able to subtly watch the game while also listen (or at least, pretend to listen) to me -- rather than complain through our entire meal that he's missing the game and then spend every other minute looking up the scores on his phone. Like many other Indian restaurants, Ashoka gives each table a complimentary order of Papadum to start. 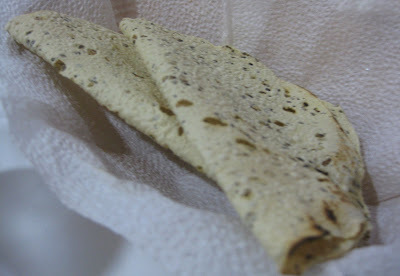 Unfortunately, as soon as I bit into it, I immediately started coughing uncontrollably -- this papadum was S-P-I-C-Y. Whew. Thankfully, the server had already brought out our waters, so I sipped mine and my coughing subsided. In addition to being unexpectedly spicy, I thought it was so hard as to taste stale. Nick, however, said he liked the papadum and that it was simply a different "style" of the popular dish. He may well be right, but if you're not used to this style, I say: be ready for spice and keep your water nearby. 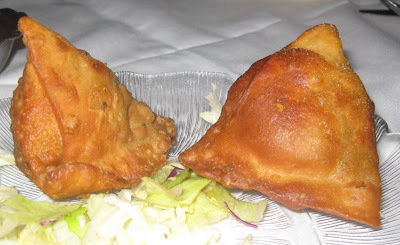 We also had an order (two pieces) of the Keema Samosas -- ground meat-filled turnovers (one of Nick's favorite dishes). 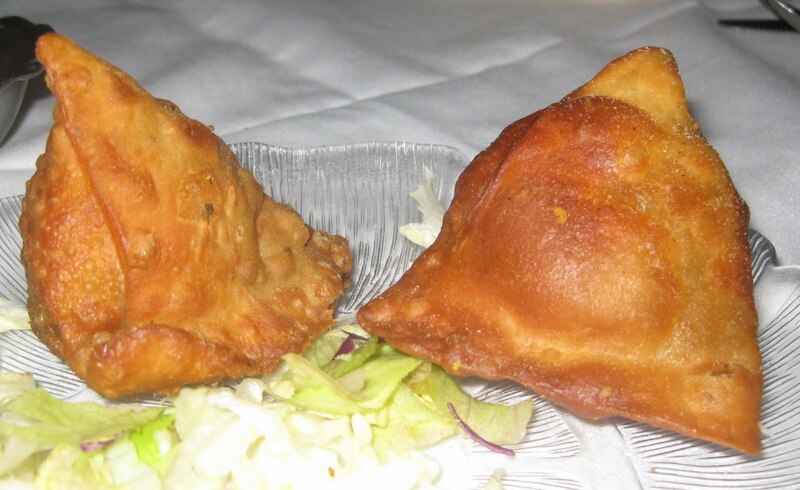 The samosas were fine, albeit a little burnt/overcooked. 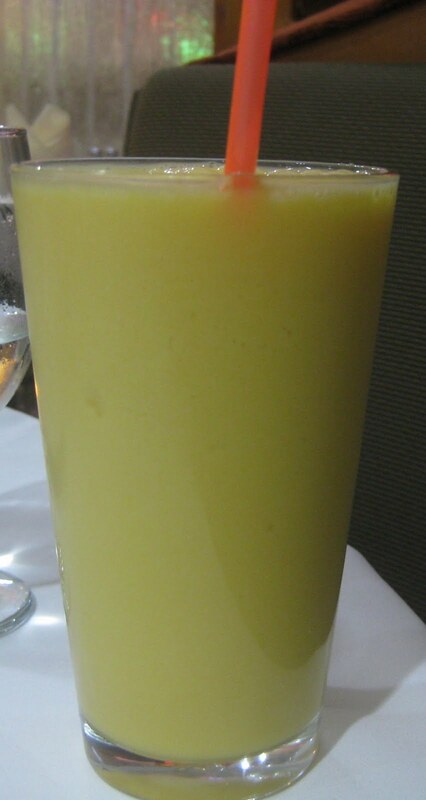 I ordered a Mango Lassi, and the drink was great. Thankfully, I've yet to find a place that can mess this up -- though if I ever do I'll probably have to have a moment of silence to mark the sad occasion. For our breads, Nick was so excited that Ashoka offered Poori -- a deep-fried puffy bread -- on the menu. For whatever reason, poori is hard to find at restaurants so anytime we come across it, Nick insists on ordering it. His mom actually gave me her recipe for poori, so that I can make it for him more often. Sadly, I haven't made it yet as I'm not as big of a fan as he is -- though he "told" on me last time we were hanging out with his mom, so I think I'm now on the hook to share the recipe on saagAHH, which will force me to make it. He definitely liked his poori. We also ordered naan, which came out fine. For his main dish, Nick ordered the Butter Chicken, described on the menu as chicken tandoored in a clay oven and cooked in butter, yogurt, and tomato gravy. The serving size was large, which was a plus, but like the papadum, it was unexpectedly spicy. Come to think of it, I don't think our server ever asked us what spiciness level we wanted with any of our dishes. That's a little odd. I decided to go vegetarian with my entree and got the Paneer Masala. Again, I just found it to be average. 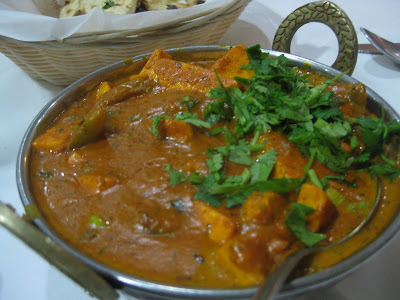 I generally love all kinds of cheese, including paneer (an un-aged Indian cheese) but I thought the paneer was too hard and that the flavor was off. Regarding the service, our busser didn't speak good English so when I asked her if I could get a take-out menu (for my records, not because I'm planning on ordering take-out from here), it definitely got lost in translation as she brought me back the dinner menu. This was probably my fault though, as I should have reminded our server about it -- I'd asked him about 20 minutes before, he hadn't brought it yet, and I couldn't find him at the time. The service also got worse and worse throughout our meal, finally culminating in the fact that we searched for our server for at least 25 minutes when we were ready to pay the bill. All in all, I say definitely don't go here if it's your first time eating Indian food. I don't want it to turn you off of the cuisine. 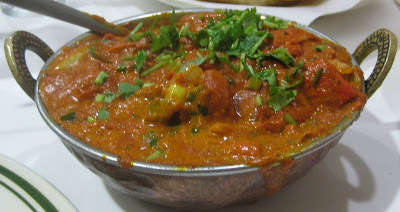 But on the plus side, it is inexpensive for a sit-down restaurant (even the seafood curries are only $9.99), the portions are large, and there's plenty of space, so it's an option for a family dinner for diners who aren't too picky. Does anyone have a "great" story to share about the restaurant? Was your service experience better than ours? Ashoka the Great, 18614 S. Pioneer Blvd., Artesia, CA 90701. (562) 809-4229. Early 50s observed the particular benefits regarding a lot more girls in to the office, as well as the types that have been designed for everyday use integrated breitling replica sale using a personalized seem, skirts in which hugged waistlines, and also blouses that have been used prudently beneath personalized tag heuer replica sale that have been pulwatches inside on the midsection to offer any replica rado diastar watches and also attractive seem in which highlighted condition and also type. The particular hourglass number started to be the best since stylised simply by performers just like Marilyn Monroe, or perhaps got around the Audrey Hepburn reserved and also style. Long gone have been the particular economic fake rolex for sale with the conflict ripped planet, as well as the fake rolex submariner watches regarding components has been widened, and thus the particular start regarding size creation regarding cost-effective trend has been certain to become accomplishment.